To mark the 48th consecutive donation from the Sunshine Appeal, we donated £2000 to the SOS Children’s Village in Skopje, Macedonia. The SOS Children’s Village in Skopje has 12 family houses which provides shelter, care and education for 84 children without parents or parental care. There were 67 children aged between 2 and 15 in the care of the village under 12 “SOS mothers”. Cover medical expenses for 20 children with regular medical therapy. The purchase of 1 washing machine for 1 SOS House. Football lessons for 20 children. Educational support for the children. Solar panels for 1 SOS House to help make the village more sustainable. When we were last in Skopje, I became good friends with some Macedonian guys and we have kept in touch ever since. It was my friend Darko Jankulovski who proposed the children’s village as our recipient due to their fantastic work that he had heard about. Due to difficult language barriers, Darko made initial contact on behalf of the Sunshine Appeal, putting me in contact with Irena at the village who helped in all the planning of the donation and the presentation and visit to the village on the day before the match. The fans visited a family home in the Village, where they met SOS mother Divna, who has raised fourteen children. They were showed around the properties which have been well maintained and clearly looked after by the children and the mothers. There was also time for a friendly game of football on the Village playground. “Aren’t they going to change? 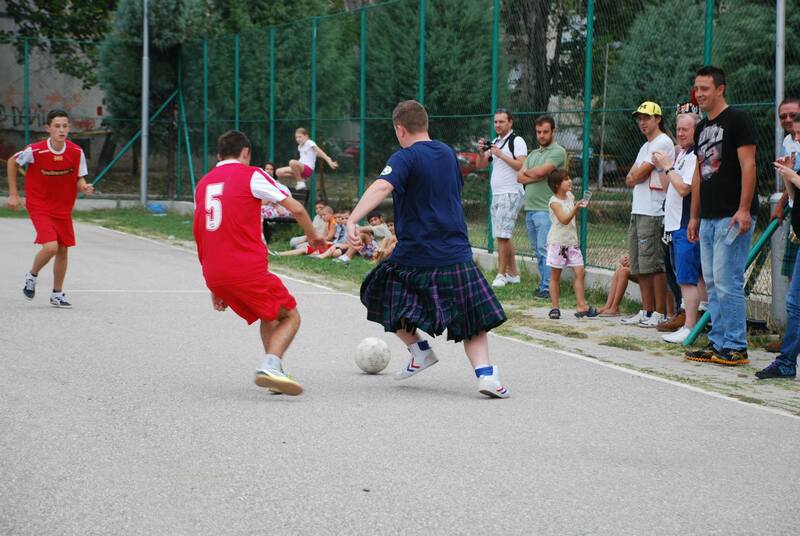 They can’t possibly play in those kilts,” wondered 16-year-old Aleksandar, as he watched the Scottish fans warm up. But five minutes into the game, the Scottish team scored the first goal. “Wow, it is possible to play in those,” murmured Aleksandar, who was playing on the Macedonian team. The children rallied and got an equaliser, the Scots were out of breath after 5 minutes in the heat of the Skopjean sun. The match went to penalties and after everyone had taken one it was decided to end the match in a draw, much to the delight of the Tartan Army who needed a cold refreshment and a lie down. The Sunshine Appeal would like to thank every Scotland supporter for their continued support of the Sunshine Appeal, without you these donations would not be possible. After we had all returned home, approximately £500 in hard Macedonian cash was sent to the Sunshine Appeal by supporters from across the world who had travelled to Macedonia and had returned with some Dinar. 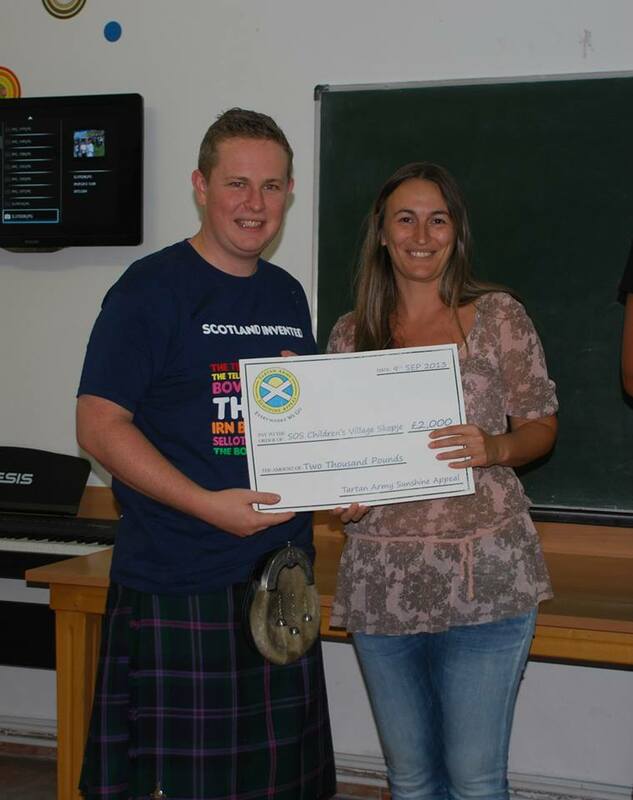 This money was presented to the recipient charity by a Scot who happened to be visiting friends in Skopje.